The 1932-D Washington Quarter has Risen Sharply in Value as the 50 State Quarter Program Gained in Popularity. In celebration of the 200th anniversary of George Washington’s birth in 1932, The Treasury Department proposed a commemorative half dollar be issued to honor the first US president. This was later changed to a quarter dollar. Many observers opined the design of Laura Gardin Fraser was the best choice for the new Washington Quarter, but it was the work of John Flannagan that won approval. Historians believe politics influenced the process. The 1932-D Washington Quarter, along with its San Francisco counterpart, the 1932-S, are the key dates in the series. Only 436,800 and 408,000, respectively, were minted. As a result of the economic woes of the Great Depression, relatively few were saved. It is estimated that only 10% of the original totals survive. That’s not enough to satisfy Washington Quarter collectors, whose ranks swelled with the introduction of the 50 State Quarter program. Photo courtesy of Ira & Larry Goldberg Coins & Collectibles Inc., Beverly Hills, CA. The popularity of the Washington Quarter has skyrocketed since the Year 2000. We attribute this to the many new collectors brought into the fold through the 50 State Quarter Program. Leading the charge was the 1932-D Washington Quarter, one of the few truly rare coins in the series. The blue line above charts the percent value increase of the 1932-D (n F-12 condition) since Year 2000. At one point, the 1932-D had increased more than five times its value in Year 2000. It has cooled off a bit since then, but we expect it to remain a hot item for collectors. 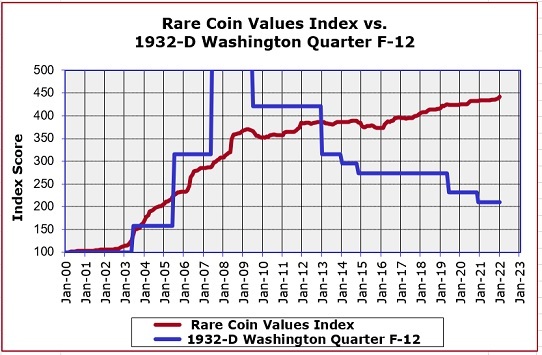 The 1932-D Washington Quarter has outperformed the Rare Coin Values Index, which computes the composite percent change since Year 2000 of a cross section group of 87 rare US coins. The objective of the Index is to keep a finger on the pulse of the overall rare US coin market. The 1932-D Washington Quarter is one of the 87 coins followed in the Index. The Index is updated monthly.